Please see below for a full list of our lawyers, or use the flyout menu under “Our Team”. Tracy graduated from St. Lawrence College with a Legal Assistant’s Diploma in 1987, and she has been working in the legal field ever since. She has been with our firm since March of 2000. She has experience and knowledge in all areas of law practiced by our firm, and she has been serving as our office manager since 2013. Tania graduated from St. Lawrence College in 1988 with a Diploma in Office Administration – Executive, and she has been working in the legal field since that time. Janet joined our firm in 2013 after working in the legal field for several years. She has experience in many areas of law. 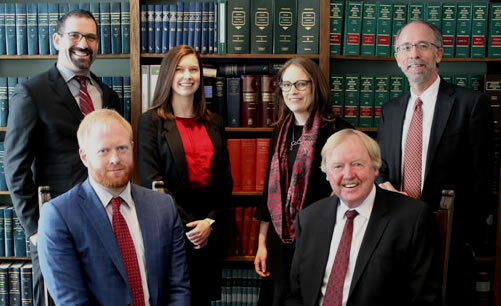 Cathy has been with our firm since 1992, after working for another local firm for many years and also working at the court for a period of time. She has significant experience and expertise dealing with complex residential and commercial real estate transactions. Debbie is our longest-serving clerk, having been with the firm since 1985. She has seen us through our many re-transformations. Sandy has worked with the firm since 1990. Although she has experience in many areas of law, she has been our estates clerk since the year 2000. Bruce has been with our firm since January of 2006. Bruce has a lifetime of legal experience and a wealth of specialized knowledge in the area of real estate. Laurie has been working with our firm in various capacities since 2003. At present, her welcoming manner is highly valued at reception, where she keeps the ship sailing smoothly. Joanne came to the firm in 2010, after 18 years experience in the legal field. She has a diploma in Legal Assistance from Algonquin College. She works primarily with Andrew Howard. Kelly joined our firm in 2002 after working in the legal field for a number of years. Kelly works primarily with Shane Kelford. Shannon graduated with honors from the Law Clerk program at Algonquin College in 2002 and has been with the firm since 2003. She works primarily with Teresa DuBois. Katiesue graduated from the Legal and Executive Office Administration Program at Algonquin College in 2016 and worked at another firm until she joined us in the fall of 2017. She works primarily with Jonathan Collings.